Studiotech Australia is sponsoring 3 technology workshops intended to inform and educated on the latest technologies for Live Media over IP in a production environment. The convergence of Information Technology and Broadcast has brought about many efficiencies in the way media is moved around in a production environment. First and foremost are the tapeless workflows and media asset management which lead on to file based distribution. Most BC/IT Engineers have their heads around this IP based technology and there have been many lessons learnt on the journey. Moving live Media around in real time adds an extra layer of complexity that has even the most seasoned IT specialist heading back to the drawing board (or Google). And there are several new standards in tow to help facilitate a smooth transition to an all IP environment with interoperability one of the key factors. 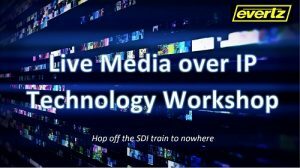 Why head down the IP path for live media transport? What can IP offer over SDI? What are the challenges in transitioning to IP for live Media transport? Some real-world examples of customer journeys and the issues they encountered, and eventually overcome.